A few days ago, I received a package of a local brand named Super Tuyo for me to try. It was very timely because I was craving for a creamy yet salty pasta. Super Tuyo is a brainchild of Gilberto Tongo of Tongo's Catering Services as a way to ship Filipino relatives abroad some tuyo without the unpleasant smell. Super Tuyo is deboned tuyo (or dried herring) in its signature chili garlic sauce. Super Tuyo comes in three flavors: Original, Sweet & Spicy and Famous Spicy. I was invited last week to visit Earth Kitchen's second location at Bonifacio High Street Central. 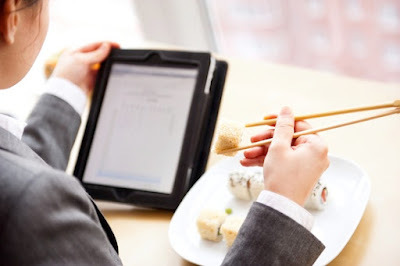 Their first location is at White Plains, Katipunan Avenue in Quezon City. Earth Kitchen is a joint project of Got Heart Foundation, Hizon's Catering, Chef David Hizon and Chef JR Trani. As part of our El Nido rendezvous, the boyfie and I also took the Island Tour B. Island Tour B rate is Php 1300 per person. It includes the tour guide, lunch, life jackets and snorkeling gear. The call time is 9:00AM for the island tours. You need to bring your swimming attire, extra clothes, towel, drinking water and sunblock. Our first stop is a dive and snorkel site. We were given ample time to snorkel in the blue waters. Say Hello to Mornings with McDonald's All-New Cheesy Eggdesal! My day is never complete without breakfast. May it be a rice meal or a bowl of oatmeal or pan de sal, having breakfast is important to have enough vigor for the whole day. Last July 24, McDonald's Philippines has introduced a breakfast item that is familiar to every Filipino: the Cheesy Eggdesal. Yabu: The House of Katsu has revolutionized their katsu once again and has introduced the limited edition Katsu Burgers. Starting last August 11, the katsu fanatics will be able to taste the two new katsu creations: the Hire Katsu Burger (Php 360) and the Ebi Katsu Burger (Php 420). Note: The Perfect Pint has relocated to Greenbelt 2 in Makati City. I was invited by Zomato last week to try this gastropub in Crossroads BGC: The Perfect Pint. The Perfect Pint is a beer drinker's paradise as they serve local craft beers on tap, best paired with delicious Filipino and Asian dishes. I was able to try the Pivo Praha Weizen (Php 250 for 400mL/Php 210 for 330mL) and 32nd Street (Php 250 for 400ml/Php 210 for 330mL). Pivo Praha Weizen (4.5% ABV, 20 IBU) is light and refreshing while 32nd Street (5.7% ABV, 14 IBU) is more on the sweeter side. 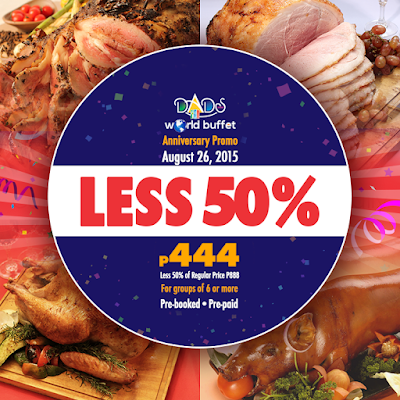 Dads World Buffet Celebrates 38th Anniversary on August 26! 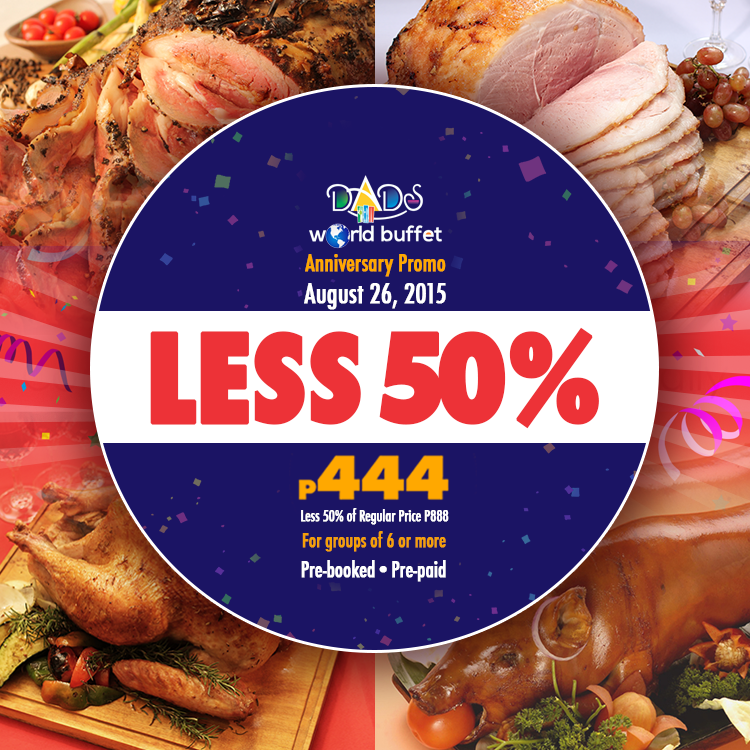 Dads World Buffet, one of the best buffet restaurants in the country, is celebrating its 38th anniversary on August 26, 2015. Kamayan opened on August 26, 1977 on Pasay Road while Saisaki opened along EDSA on December 6, 1985. Dads opened its first location in SM Megamall on November 25, 1993. During the early 2000s, the three buffets was combined and introduced as Dads Crossover Buffet. At 2013, DadsWorld Buffet was born. Dads World Buffet gathered more cuisines from around the world in their buffet table. This includes Europe, Asia,North America and South America. From the US, there's the US Roast Beef and US Roast Turkey. Make It Personal! Design Your OWN Candy at Made in Candy! Made In Candy has made life sweeter and more fun with their limited time promo Make It Personal! From August 15-22, 2015, you can design your own candy at the Made in Candy Powerplant Rockwell for only Php 350 for a Large Jar. 1. Only four (4) Large Jar Customized Candy Design will be accepted per person, per receipt, per day. [UPDATED] 4th Anniversary Giveaway #9: K&L Cafe by Blushing Cupcakes! I am so happy to share with you a lot of giveaway this year. This weekend, we have K&L Cafe by Blushing Cupcakes! K&L Cafe proudly uses Sagada coffee beans and they have brought the flavors of Baguio in some of their dishes.You only need to drive to K&L Cafe to experience Baguio goodness! Ippudo Philippines introduced a limited edition ramen that will keep you sweating: the Spicy Black Ramen! Launched last July 29, Ippudo Spicy Black (Php 490) is inspired by Singaporean cuisine, which is greatly influenced by Indian, Malaysian and Chinese flavors. Choco Rainbows with Every Bits Nips Chocolate Bar! Nips always been a part of every Filipino kid's childhood since the 1960's. I myself loved these candy-coated chocolate and would make sure that I have Nips on my stash every time. It is with great pleasure to introduce to you the newest sweet snack that you will surely love: Nips Chocolate Bar. Let's continue the ramen craze with another giveaway: Ippudo Philippines! Having opened their first store in the Philippines last September 2014, Ippudo continues to draw ramen fanatics with their three signature ramen bowls: the Shiromaru Motoaji, Akamaru Shinaji and Karaka-men. They also introduce a limited edition ramen bowl and more side dishes every now and then. Ippudo PH currently has one branch in SM Megamall, but will be opening a store in Robinson's Manila soon. I lead a hectic lifestyle: I work during the day then blog or meetup with friends at night, while doing other stuff in between. As much as I want to keep tabs with what I eat, it's inevitable that I eat more than I should. I am excited to share my new discovery that helps me burn excess fat: MySlim Yerba Mate Drink and MySlim Slimming Capsules. The edible cookie dough craze is here! I was recently introduced to Kukido by Starry Nights Cafe. 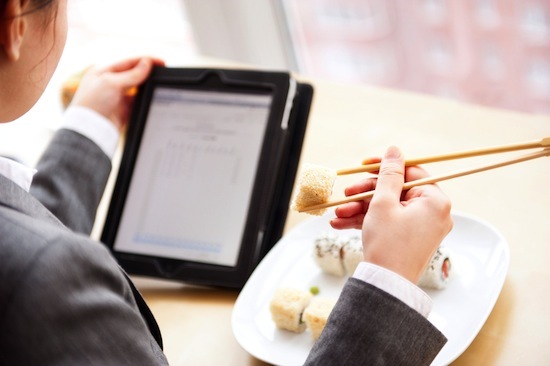 Kukido is owned by Van and Hana, foodies with a passion for film and pop culture. Kukido is purely made from local ingredients, the flour used is heat-treated and the cookie dough is egg-free. Kukido is currently available in two sizes: Han Solo (4 oz) and Share-bacca (10 oz). Alvin and the Chocolate Chipmunks, or chocolate chip cookie. 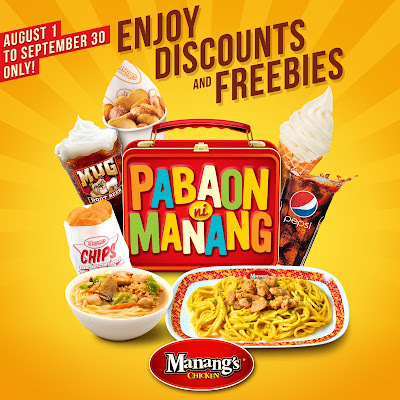 [UPDATED] 4th Anniversary Giveaway #7: Manang's Chicken! Here’s the best Back to School deal to start the school year off right. 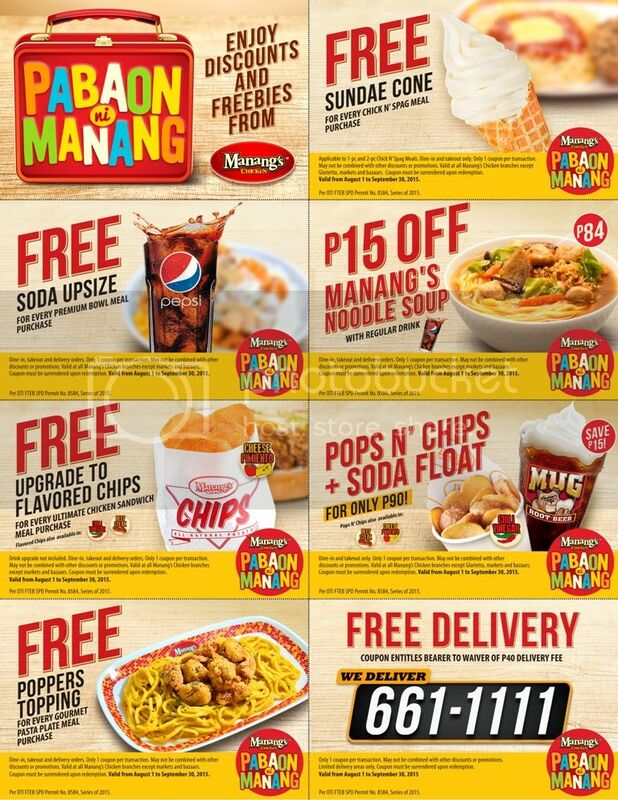 Manang’s Chicken, one of the fastest growing fast food restaurants in the country today, is bringing back its Pabaon Ni Manang coupons. From August 1 to September 30, customers are entitled to freebies such as Free Sundae Cone, Free Soda Upsize, and waiver of P40 delivery fee upon presentation of the discount coupons. You can also avail of Noodle Soup and Pops N’ Chips combo meals at a discounted price. You may download the coupon here. You may use the coupons at Manang’s Chicken branches at Glorietta Food Choices, Katipunan Avenue, Taft Avenue, SM City Dasmarinas, The District Imus, Tomas Morato, The Annex SM North, Puregold Cainta Junction, Dapitan St. Manila, Ever Gotesco Recto, SM Fairview, Fairview Terraces, SM San Mateo, and Gaisano Mall of Davao. Manang's Chicken is a fast casual restaurant best known for their crispy fried chicken with Manang’s secret glaze. They started in 2010 at a weekend market and has grown to 14 branches to date. Manang's also offers other reasonably priced Filipino comfort food with a twist. Last week, I was invited to an intimate gathering of bloggers to discover the art of taking time with Swift Premium Corned Beef at Pio's Kitchen. Swift Premium Corned Beef believes that delicious food takes time to prepare, like the slow-cooking process needed to achieve that tender, flavorful and less fatty Swift Premium Corned Beef. We had a lovely dinner treat full of well-prepared dishes courtesy of Chef Chin Gallego, chef and owner of Pio's Kitchen. Chef Kel Zaguirre of the Locavore fame has opened a new restaurant in BGC that specializes in anything fat and delicious: the restaurant aptly named FAT. Currently on its soft opening, the people behind FAT strongly believes that fat is not evil, as it is necessary to bring out the flavor of the food. For starters, I had the Pork's Ear En Croute (Php 370), one of the FAT snacks on the menu.